Bill Levine (L) and Tom McAvoy (R) at the ceremony. Below: the Faculty and Staff Commitment Award fountain outside the Glenn L. Martin Building. Two recently retired ISR faculty members were honored on Oct. 29 by Dean Darryll Pines for their years of service and commitment to the A. James Clark School of Engineering. Professor Emeritus Thomas J. McAvoy (CheBe/ISR) and ISR-affiliated Research Professor William S. Levine (ECE) were recognized for their service to the college and their commitment to teaching, among other credentials. The Faculty and Staff Commitment Award was established in 1997 to honor faculty and staff of the Clark School who exemplified an extraordinary level of commitment and service to the college. 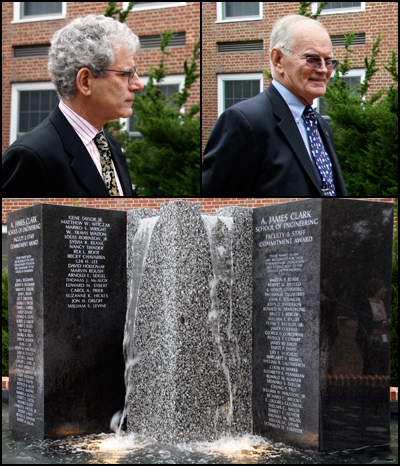 To date, 82 faculty and staff have had their names engraved on a commemorative fountain outside the Glenn L. Martin Building. Three faculty and two staff members made up this year's honorees.